A classic work of literature by “the greatest author ever produced in Latin America.” (Susan Sontag) Brilliant physician Simão Bacamarte sacrifices a prestigious career to return home and dedicate himself to the budding field of psychology. 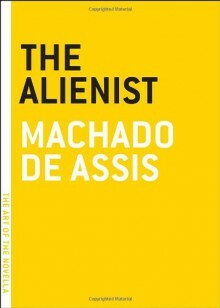 Bacamarte opens the first asylum in Brazil hoping to crown himself and his hometown with “imperishable laurels.” But the doctor begins to see signs of insanity in more and more of his neighbors. . . . With dark humor and sparse prose, The Alienist lets the reader ponder who is really crazy. ***This is a Hybrid Book.Melville House HybridBooks combine print and digital media into an enhanced reading experience by including with each title additional curated material called Illuminations — maps, photographs, illustrations, and further writing about the author and the book.The Melville House Illuminations are free with the purchase of any title in the HybridBook series, no matter the format.Purchasers of the print version can obtain the Illuminations for a given title simply by scanning the QR code found in the back of each book, or by following the url also given in the back of the print book, then downloading the Illumination in whatever format works best for you.Purchasers of the digital version receive the appropriate Illuminations automatically as part of the ebook edition.